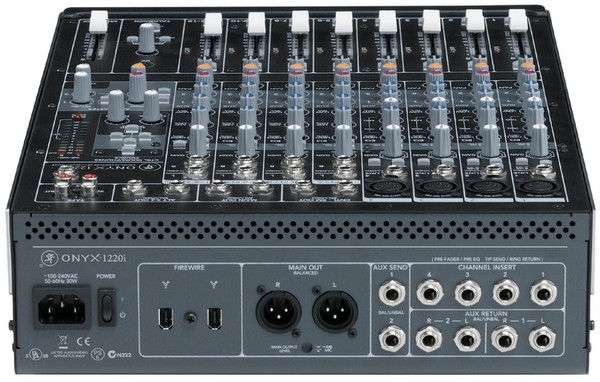 Mackie Onyx 1220i kombinerar en 12 kanals mixer med ett firewire audiointerface/ljudkort. 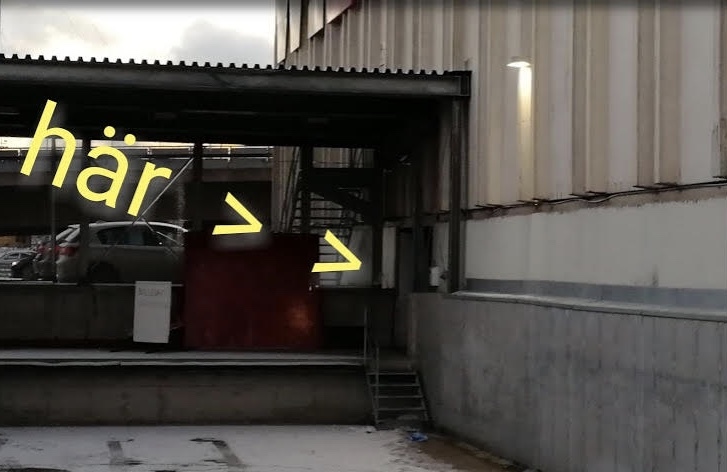 Kan styra alla kanaler samt master och AUX av ex. Logic. Även uttrustad med Mackie Onyx mikpreamps och Perkins EQ och är perfekt för dig som söker ett ljudkort men som även vill ha "hands-on" –kontroll over din musik. 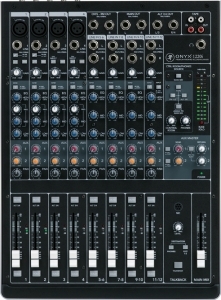 Mix Integration — Stereo return from the computer can be routed to either the control room for instant monitoring or to a stereo channel for mix integration. 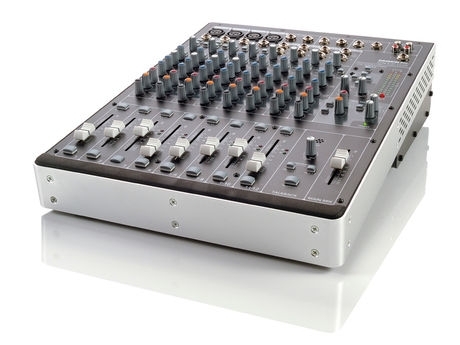 Latency-Free Overdubs — Having a "real" mixer has its benefits. Latency-free overdubs are simple since you are using an analog mixer. No more wasted time dealing with the complicated "DSP" mixers commonly used on standalone interfaces. 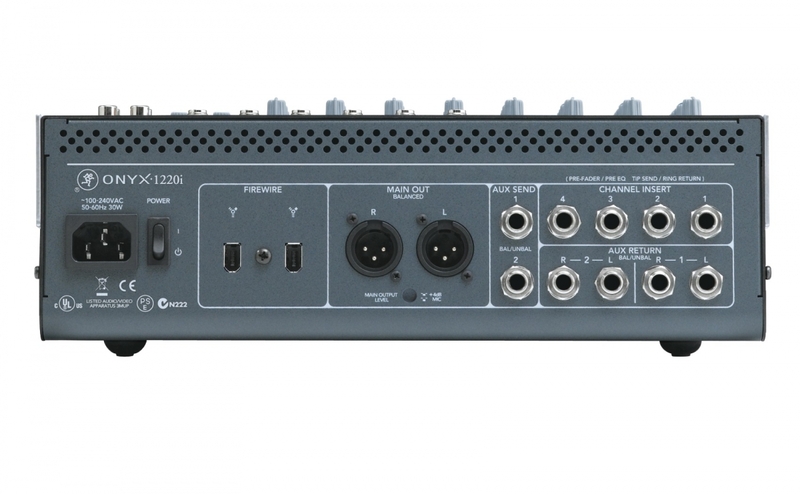 The 1220i delivers seamless, routing-free FireWire connection to your favorite DAW. All channels, auxes and (of course) the master L/R are simultaneously available to your DAW, with zero routing. The Onyx-i FireWire connection has amazing bandwidth, and the 1220i takes full advantage. 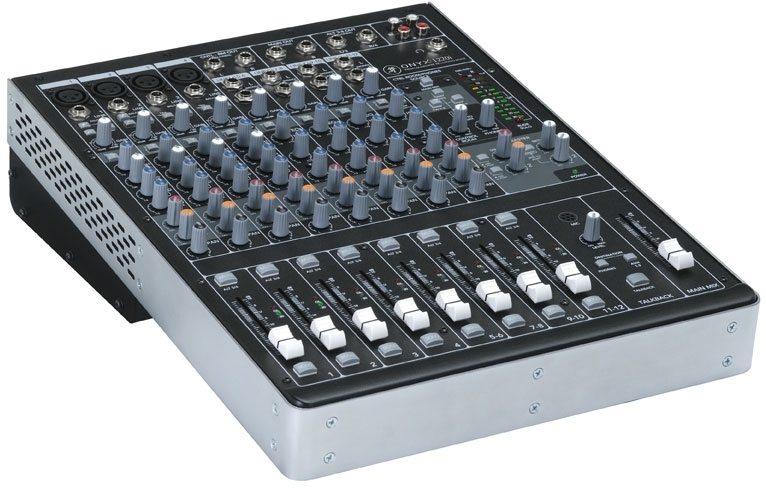 When it comes to the high pressure environment of a recording session or live performance, you simply cannot beat the stability and reliability of an analog mixer. With features honed over 20 years of design by some of the legends in the industry, the Onyx-i Series mixers are simply the best sounding full-featured analog mixing boards available to the modern sound engineer. 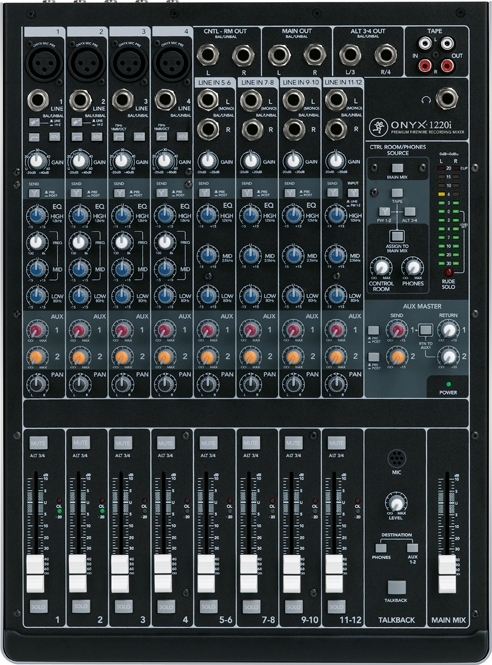 The 1220i has a plethora of analog features that are sure to please. First off, there are four Onyx mic preamps which have been proven as some of the best boutique quality preamps available today. 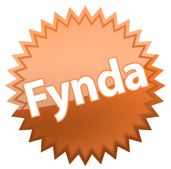 That is, without having to re-mortgage your house in order to pay for all the inputs you need. Then there’s the Perkins EQ, which offers highly musical Q filter without sacrificing the precise control that Mackie EQs are known for. Four mono mic/line channels feature 3-band Perkins EQ with a sweepable mid and the additional stereo line channels have 3-band EQ. So, regardless of the type of signal you need to input, there is sure to be a channel with the right EQ for the application. Other analog tools include two aux sends with pre/post fader assignment, allowing for monitor mixes, effects loops or additional headphone mixes. There are built-in DIs on the first two channels for direct connection of guitars or bass and a dedicated talkback section with a built-in mic that lets you easily communicate with band members while on stage or recording. With all these proven, great-sounding analog features, it is easier than ever to create a memorable mix. The Onyx 1220i offers a tremendous collection of professional analog features and extremely deep DAW integration, but it is so much more than that. The sleek, modern design might even tempt you build a museum quality display for your engineer friends to admire. 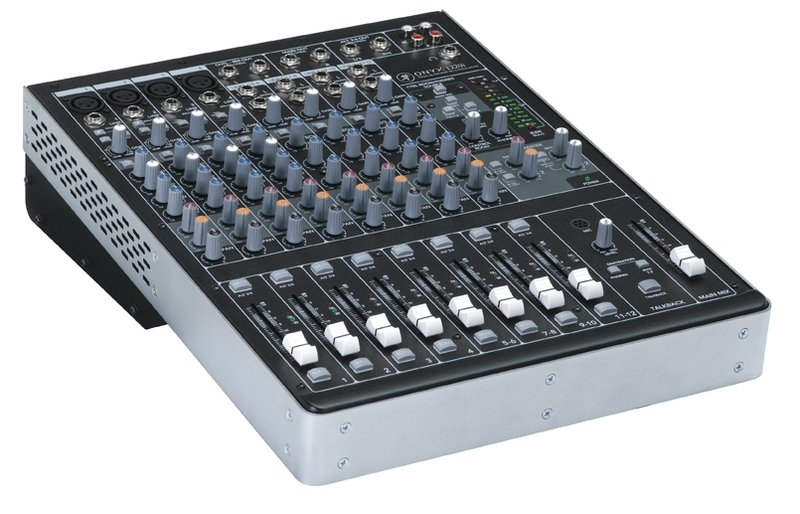 Plus, since it’s a Mackie, you can be sure that it is "Built-Like-A-Tank" and will survive years of abuse. Any audio company can cram a bunch of inferior components into a chassis and, believe us, a lot of them do. This is never the case with a Mackie mixer. Everything about the Onyx-i Series smacks of quality, because only the most quality, high-end components are used throughout the entire signal path. At the front end, you have the pristine signal boost offered by the Onyx mic preamps, which will likely get routed through the legendary Perkins EQ. The signal then passes through a series of sealed rotary knobs, which keep dust and grime out of the potentiometer. Then your mix hits the summing bus, which has been custom-designed to offer the highest possible headroom while preserving the sonic quality offered by the aforementioned components. Maybe you assigned the signal to stream across the FireWire outputs. If so, they had the pleasure of passing through the high-quality Cirrus analog-to-digital converter on their way to your computer. Or maybe you were overdubbing and streamed your backing tracks from your DAW and integrated them into the mix. In that case, you can thank the ridiculously high-end AKM digital-to-analog converter for the immaculate quality of the playback. These converters are extremely high-quality and easily rival the most esoteric (and expensive) interfaces out there today. From start to finish, no matter how you use it, the 1220i offers the quality demanded by industry professionals.